Warning: Critical plot details will be divulged in this post. Director Alejandro González Iñárritu uses a perfect blend of mercy, hope, and desperation to fuel his masterpiece, Babel, into an emotional powerhouse. No scene is more evident of such brilliance than the one in which Cate Blanchett’s character is evacuated from a local Moroccan village. After being struck by a stray bullet, Blanchett is taken to a nearby village to be cared for by her husband, Brad Pitt, along with a compassionate tour guide (first-time actor Mohamed Akhzam). Pitt tries frantically to get help from the local and US governments, and embassies; from virtually anyone who can get them out and to a hospital. Throughout the picture, Akhzam helps Pitt by getting him a phone and medical attention for his wife. Yet Pitt constantly battles Akhzam, taking all of his pain and frustration out on the only man willing to help. After hours of struggle, a rescue helicopter finally arrives. At the sight of the helicopter, a beautiful guitar piece plays over the soundtrack, the Kronos Quartet’s "When Are Wings Are Cut, Can We Still Fly?" As the guitar strings are plucked frantically, Iñárritu uses very fast cuts to heighten the confusion. The chopper lands and dozens of people scatter around, dusts flying through the crowds, but amidst the chaos, Blanchett’s injured body is put on board. The moment to look for is when Pitt, following his wife on the chopper, turns around and embraces Akhzam, hugging him, demonstrating his most earnest thanks. 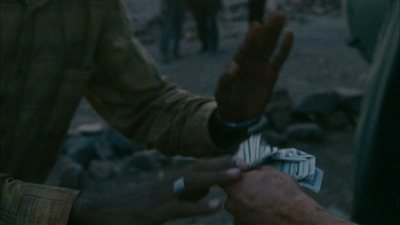 Once they separate, Pitt reaches for his wallet and pulls out a wad of money, handing it over to Akhzam. With their voices inaudible as the song continues, Akhzam puts up his hands and refuses to accept the cash. Pitt tries a second and third time, begging the man to take what he deserves. When Akhzam refuses for a last time, Pitt puts his hands down, staring at his friend. 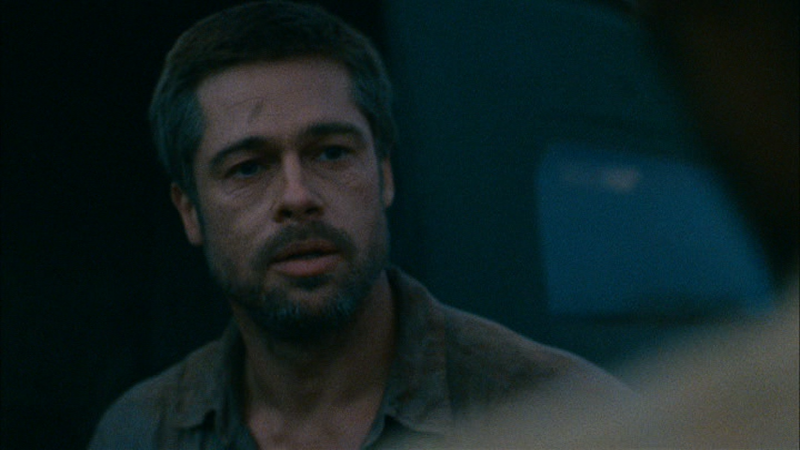 If there has ever been any doubt in your mind that Brad Pitt cannot act, then watch this scene. Watch his eyes when he tells the man thank you. The scene lasts for only half a minute, but its impact is enormous. In a film filled with intense and disheartening moments, you will instantly feel the goodness that man can accomplish. Pitt's work in Babel is phenomenal. I like that scene, and when he helps his wife pee, and especially when he makes that phone call from the hospital to his kids. It's amazing that I've only watched this film twice, and the last time was over two years ago, yet I can recall these scenes perfectly. It shows how great he and Babel is. Both really good scenes there. He's breathtaking in this movie. Floors me everytime. In fact, I think it has been about two years since I last watched it too. Time to amend that ASAP. Excellent post, I watched Babel recently and reviewed it, you should check out my review of it. Thanks man! Dude, I JUST SAW that you posted it, and was reading it as you posted this comment. That's awesome. Kronos Quartet’s "When Are Wings Are Cut, Can We Still Fly?" 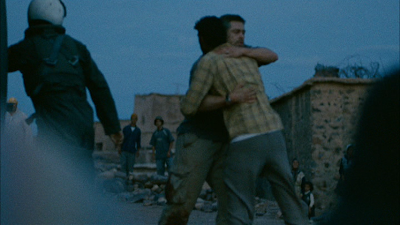 (which can be found on the OST of Iñárritu's "21 Grams") is close to but not the same as the track used in this powerful and transfixing scene. The actual music is (50" into) a track entitled "Deportation/Iguazu" on the Babel soundtrack. Yep, realized that a while after I wrote this. They are eerily similar though, aren't they? I touched on this very moment a little while back, and had no idea you saw so much in this scene too! Its something else man. My pick for his best film, without a doubt. It's still a tough call for me. Whenever I watch one of this first three films, that one becomes my favorite Iñárritu film. Know what I mean? Babel is probably still my favorite, but 21 Grams... wow.